Tony Luna is founder and president of Tony Luna Creative Services, a Creative Consultancy, which he formed in 1971. As a Creative Career Consultant he has assisted over a thousand entrepreneurs and hundreds of businesses to start or reinvent their endeavors in the creative arts and other professions to build meaningful and fulfilling careers. Over the past forty-four years he has been Artist Representative, Producer, and Executive Producer for Wolfe And Company Films. During that time he has worked with Director/Photographer Dan Wolfe for a wide variety of clients including editorial and collateral projects, as well as memorable advertising campaigns for VISA, Apple-Macintosh Computers (introduction of the Apple Macintosh in 1984), Kawasaki Motorcycles and Jet Skis, Honda Motorcycles, Denny's Restaurants, Taco Bell, Carl's Jr. Restaurants, McDonald's, Bank of America, and Disneyland Resorts among others. He produced an aerial sequence for the Emmy award winning and critically acclaimed two-hour PBS documentary, The Face-Jesus in Art, which chronicled numerous artistic cultural interpretations of the image of Jesus Christ from the beginning of Christianity. He was co-founder, with Photographer Harry Liles, of New Media Marketplace, a digital production service for new media development including interactive media and computer generated effects for entertainment, medical/pharmaceutical and business applications. Mr. Luna is an Adjunct Professor and has been an instructor at the Art Center College of Design in Professional Practices for the creative entrepreneur since 1983 in the Photography Department, and more recently in the Humanities and Sciences Department-Business Practices division, and the Art Center at Night Public Programs. He has been a member of the Curriculum and Steering Committees as well as an Instructor in the Art Center/CalTech Entrepreneurial Fellowship Program, which brought together top design, engineering and MBA students in an intensive business boot camp for the development of new business opportunities. He also teaches a series of highly regarded career reinvention classes titled, Crafting a Meaningful Career- Parts One, Two, and Three to mid-career professionals who are looking to take their careers to the next, most meaningful level. For more information about these exciting classes and to become inspired by the accomplishments of past participants in the classes, workshops and consultations please log on to the Tony Luna Creative blog site at www.tonylunacreative.com. He is a past member of the Board of Directors, and Arts Committee Chair of U.P., Inc. This unique non-profit organization, started in 1992 after the Los Angeles riots, helped promote its talented young participants into education and employment in the creative arts industries. In 2006 Allworth Press released Mr. Luna's first book titled, “How to Grow as a Photographer: Reinventing Your Career” (now in its third printing) which features interviews with legendary photographers and chronicles how they achieved success on a professional and personal level. 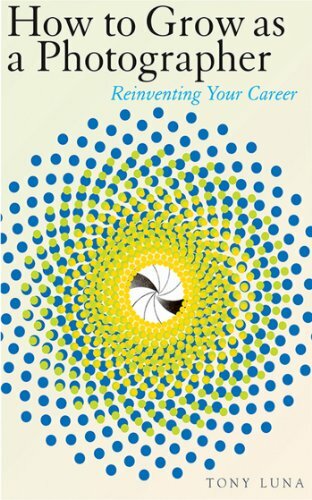 This informational and inspirational book is a must for mid-career professionals who wish to embark on a new iteration of their careers, as well as emerging artists who need to know what their profession will expect of them and how they can prepare for their careers. His latest book, “Mastering the Business of Photography” focuses on what successful photographers do the other eighty-five percent of the time when they are not shooting amazing photos. It was released in 2014 also through Skyhorse/Allworth Press. 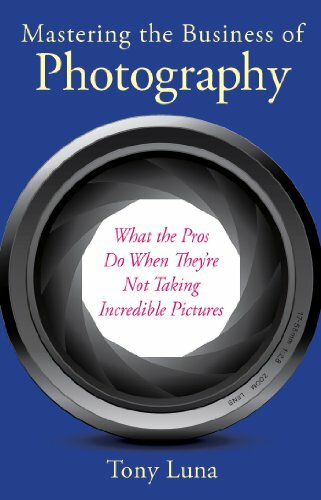 He contributed a chapter "Starting Your Career as a Freelance Photographer" by Tad Crawford and Chuck DeLaney for Allworth Press. And he is a Contributing Editor to Bok-eh: The Art and Life of Photography, an online iPad (TM) and iPhone (TM) publication. Tony Luna is a contributing author to the international best selling inspirational book series, “A Second Helping of Chicken Soup for the Soul”, “The Chicken Soup for the Soul Cookbook”, and “Chicken Soup for the College Soul.” Together with his wife Paula, Mr. Luna has co-authored The Disaster Recovery Handbook and instituted Disaster Recovery Services to assist survivors of disasters in their emotional and physical recovery process. He has been a guest lecturer for Advertising Photographers of America, Professional Photographers of America, PhotoPlus/East and West Conferences, UCLA Extension, Photo Design Magazine, Photo District News, and the Society of Photographers and Artist Representatives, California Institute of Technology-the Caltech Y, Brooks Institute of Photography, OTIS College of Art and Design, the Rocky Mountain School of Photography, Santa Monica College, and Keynote Speaker: ANIF-a trade organization for the Professional Photographers of Portugal at their Fiftieth Anniversary conference. He has been a recipient of the Outstanding Teacher Award at the Art Center College of Design, and has been honored by inclusion in the Who's Who of Outstanding California Educators, the Who's Who of Media and Communications, and the Who's Who Among Hispanic Americans.